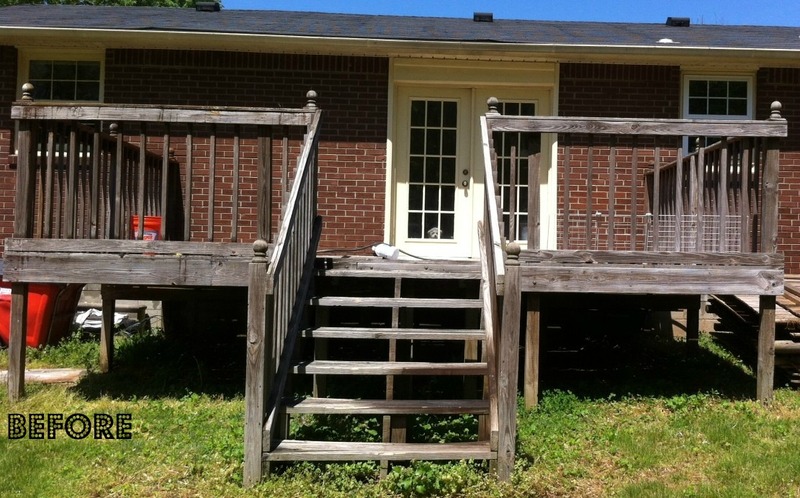 When I first saw our house I thought “Whoa…there’s a big deck.” Lucky us! But I also knew something major would have to happen with this deck since it had been neglected for God knows how long. How can a deck get so bad? I just don’t know. Living in this house for only four months, I have no clue when or if the deck was done. 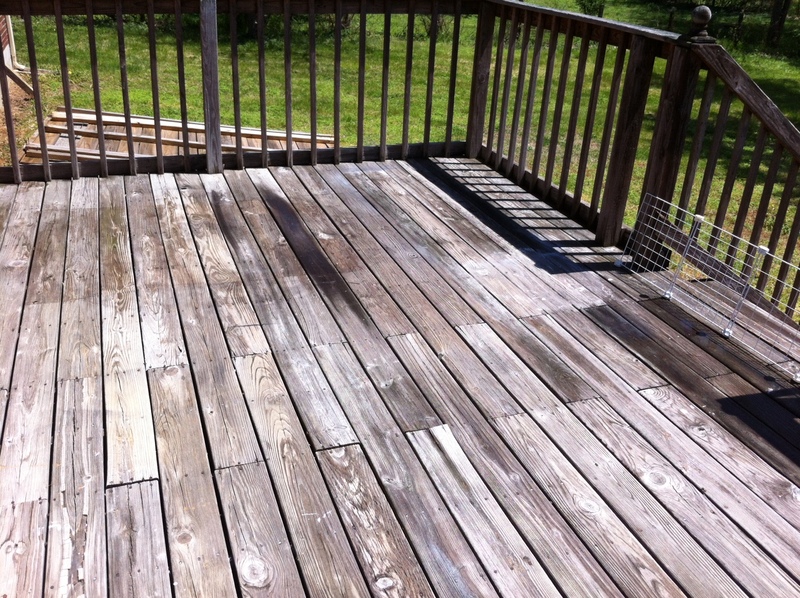 To start off, cleaning the deck is the MOST IMPORTANT step of the staining process. 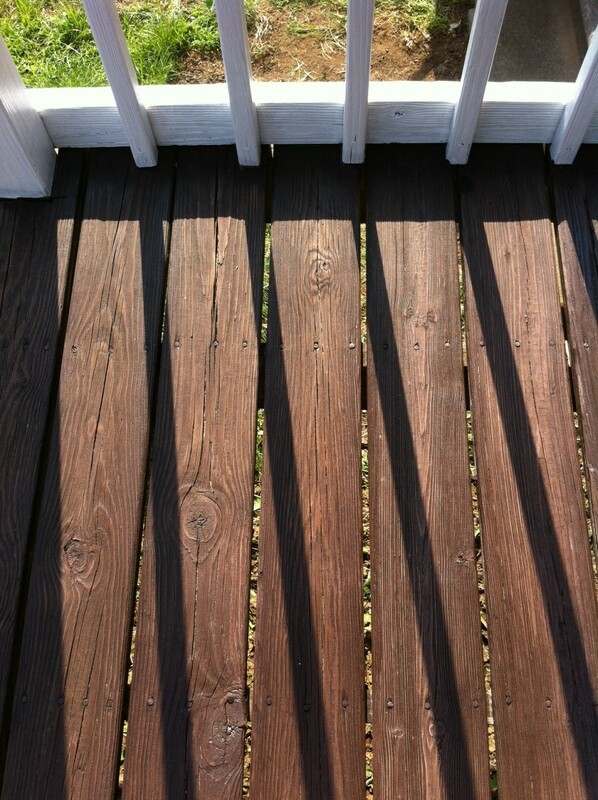 Whether previously coated or bare wood, cleaning the wood deck surface is a must– I was told at Lowe’s. I used a stiff bristle broom and this Olympic cleaning product to remove dirt and mildew. The cleaner really made a nice clean surface for staining. I decided to use this Olympic stain. I wanted the deck to look “finished” but not painted. 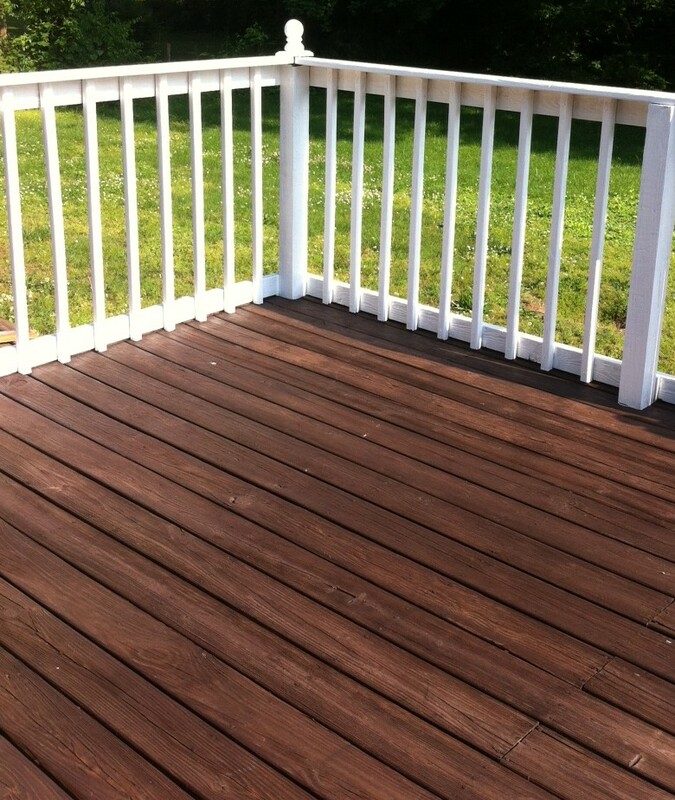 This product was easy to use and it gave the deck a finished look and waterproofed at the same time. I needed 1.5 gallons for my deck. 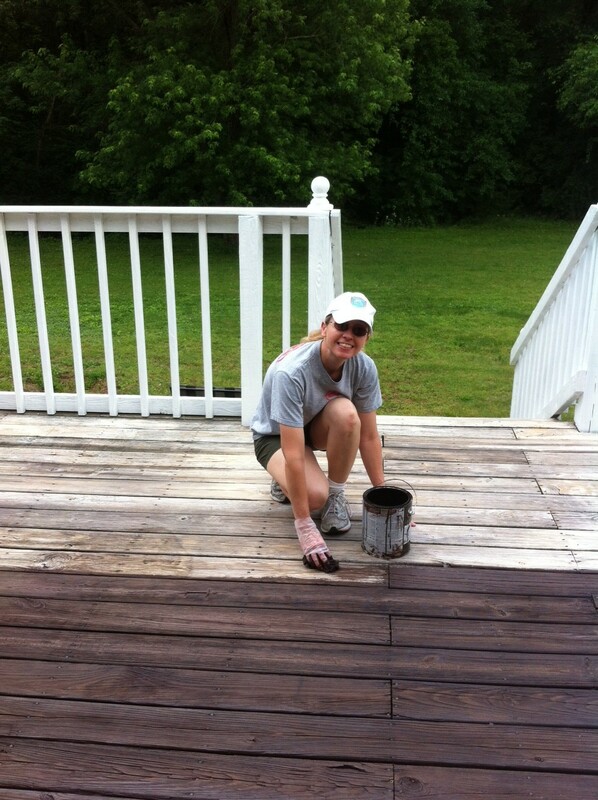 I stained the deck with an old rag but used a small paint brush for the hard-to-reach areas between the rails. So far so good. Only time will tell if the product can stand up to the sun and weather. 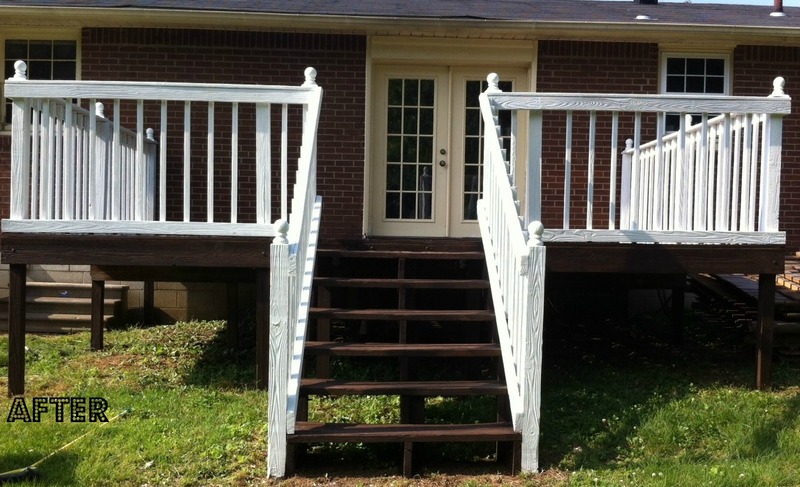 I wanted a dark stain for the decking and white paint for the railing. I love the contrast and was happy with the results. 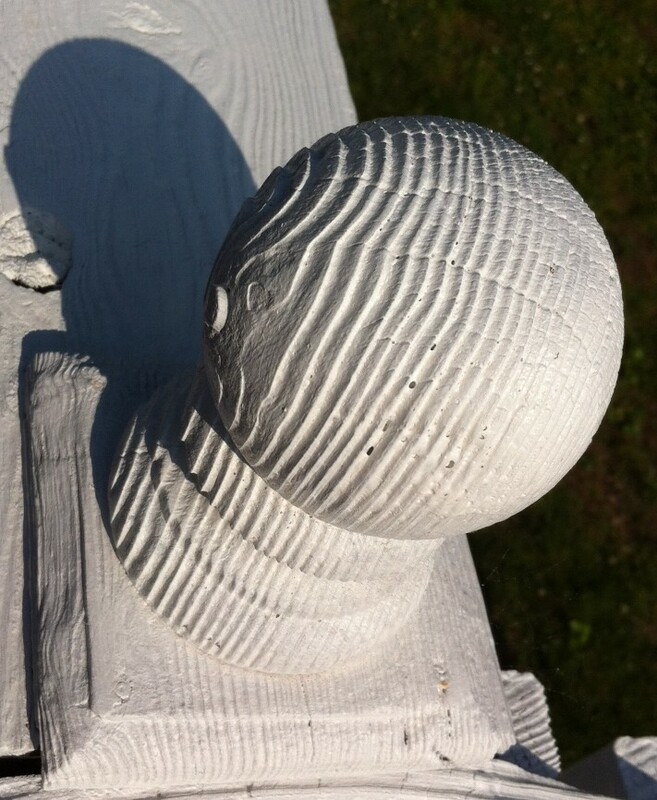 For the railing I used a white paint specifically for decks. I was lucky to have found two gallons at ReStore for $3 each. I did two coats and ended up using 1.5 gallons of paint. Overall, the process of staining and painting the deck wasn’t difficult yet very time consuming and laborious. But all well worth it to get this finished look! Wow! If you could move that house and yard to Los Angeles, it would be worth millions. Let’s put it on a truck! Haha! what color of deck stain did you go with? Hi Jenny. I chose the color Espresso.